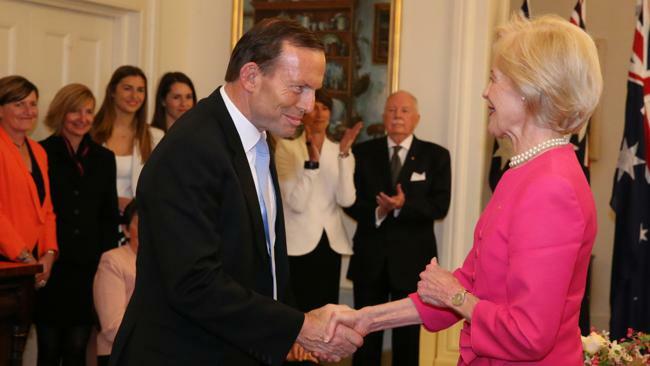 Image: Governor-General and Chief Scout of Australia, Quentin Bryce (right), formally appoints Tony Abbott as the new Australian Prime Minister, in Canberra today (Image source: http://www.heraldsun.com.au/news/national/tony-abbott-has-been-sworn-in-as-the-nation8217s-28th-prime-minister/story-fni0xqrb-1226721744714). Scouts Australia continues to be the focus of attention from the Royal Commission into child sexual abuse. While former Scouts leader Steven Larkins was a volunteer with the Scouts, he was employed at various times by the NSW government, the Lutheran Church and the Catholic Church’s St. John of God order. Allan Currie Evidence: Yesterday, the commission quizzed Allan Currie, the Scouts official responsible for Larkins at the time. He claimed that, prior to February 1997, he had not heard of rumours about Larkins. In July of that year, following a series of anonymous telephone calls regarding Larkins, Currie requested a police check on Larkins. When Currie received a call from police, who asked if Larkins had been suspended, Currie did not ask why police were interested in Larkins. There is a slight problem here in that Currie should have known it was partly in response to his own complaint about Larkins. Currie went on to say he did not remember being told by police there was a complaint about Larkins. Counsel Assisting, Gail “Snow White” Furness (see previous postings) did not pursue this matter further. Again in the same year, after complaints were made about Larkins giving kids sweets at a swimming pool, he was removed from having face-to-face contact with children (see yesterday’s posting), but not expelled from the Scouts. Currie claimed that “there was not enough evidence” to expel Larkins, as “most of the stories were only hearsay” and that he “had not seen any documentary evidence of any misdemeanors” by Larkins. Also, Currie claimed, “We had nothing from any authority to say he had done anything wrong”. Despite admitting to not seeking legal advice, Currie claimed he could not expel Larkins, saying “I don’t think our procedures at the time would have allowed me to do that”. He also admitted that he was new to the job then, and “had no training in how to deal with the allegations” against Larkins. In the end, because “We didn’t know whether to go one way or the other, the suggestion was we ask him to resign”. Currie admitted that there was the complication that Larkins was part Aboriginal and there was the worry that, if he was dismissed, “he could then use the racial discrimination card.” So Larkins was merely suspended. Currie wanted to pressure Larkins against appealing his suspension, because, as stated in a letter from Currie to Larkins, “This type of publicity, as you would realize, is something that we in Scouts Australia can well do without.” Currie conceded to the enquiry that he and others were encouraging Larkins to quietly resign rather than challenge his suspension, so that the abuse would not come out publicly. Knowing that Larkins was employed as a house parent for children, Currie used the pressure that, under the appeal process, evidence revealed could “jeopardize” his employment. Larkins did not appeal his suspension, without his employers being informed of the allegations. Problem solved. Larkins did not resign for another 3 years, and then only because of a formal complaint to police by a victim, and another suspension by Scouts Australia. Peter Olah Evidence: The head of the New South Wales state branch of Scouts Australia, from 1999 to 2002, was Peter Olah. He told the enquiry that he had “inherited half a filing cabinet drawer” of abuse complaints, dating back over 50 years. Perhaps these were “bad Scout” files like the Catholic Church’s “bad priest” files, revealed at earlier enquiries (see previous posting). Presumably, the Commission has ordered the hand-over of these files to its officers, for perusal. Olah further admitted that Scouts had “absolutely” failed children. He told the enquiry that he had received about 10 complaints about child sexual abuse during his three years in the job, but he could not remember if he advised police or the NSW government Department of Community Services. Olah claimed that there was nothing on his extensive files about the incidence of Larkins offering children sweets at a swimming pool, and trying to entice them back to his home to form a new Scouts group. When he found out, he claimed he notified both the police and the local Joint Investigation Response Team, comprising staff from the NSW state government Department of Community Services, but “did not hear back from them”. Although he was aware that rumours about Larkins were widespread in the Scouts, it was not until a complaint was received in 2000 that he suspended Larkins, who later resigned under pressure of information reaching his ultimate employers, the NSW government. Since Larkins had faked his clearance to work with children, this was a very real threat. It was for this fraud, and not the abuse, that Larkins was eventually jailed. Graham Bargwanna Evidence: The current head of Scouts in New South Wales, Graham Bargwanna, also gave evidence. After all of the usual tripe about things being better now than before, Mr. Bargwanna was asked about insurance claims against the organisations by victims. While admitting that payments had been made, Mr. Bargwanna declined to give details, saying only that it was “a lot” of money. He further merely stated that “We have a close working relationship with our insurers”. Given that it has been demonstrated at the State enquiries in NSW and Victoria that insurers were calling the shots in relation to responses to victims (see previous postings), this should have been explored in some detail. Under questioning, Mr. Bargwanna said that, with regards to the Scouts’ insurers, “We will talk to them about any aspect of our business that we do.” It is perhaps revealing that he chose the word “business” to refer to his organisation. Further questioning was interrupted when the Scouts’ lawyer noted that the confidentiality agreements which Scouts had victims sign, could not be produced because the Scouts were planning an Appeal Court challenge to their release. The lawyer was reminded that the commission had the power to get the documents anyway, and formally requested that they be provided forthwith. Hopefully, their general content will be revealed by the commission at some point. Chief Scout of Australia, Governor-General Quentin Bryce, did not appear or comment today. She was occupied, in Canberra, officially swearing in the new Australian Federal Government. This entry was posted in Uncategorized and tagged (Australian New South Wales Government) Special Commission of Inquiry into Matters Relating to the Police Investigation of Certain Child Sexual Abuse Allegations in the Catholic Diocese of Maitland-Ne, Allan Currie, Australian (Victorian State Government) Inquiry into the Handling of Child Abuse by Religious and Other Organisations, Australian Royal Commission into Institutional Responses to Child Sexual Abuse, Catholic Church, Catholic Church’s St. John of God order, Chief Scout of Australia, Gail “Snow White” Furness, Gail Furness, Governor-General of Australia, Graham Bargwanna, Hunter Aboriginal Children’s Service organisation, Lewin Blazevich, Lewis Blayse, Lutheran Church, New South Wales Inquiry, NSW government, NSW government Department of Community Services, NSW Inquiry, NSW state government Department of Community Services, Peter Olah, Quentin Bryce, Scouts, Scouts Australia, Steven Larkins, Tony Abbott, Victorian Inquiry. Bookmark the permalink.